Alright, people. I’ve got to be honest here. I’ve staked my reputation here on blunt honesty, so I’m just going to say it: when I saw what Button Shy Games was up to, with their large collection of “wallet” microgames, I rolled my eyes a bit. I mean, it’s a gimmick–there’s no getting around that. AEG’s mega-hit Love Letter was a cool novelty and fad, but there’s not that much game there. How can you build your entire publishing company around games restricted to 18 cards? Then I demoed a couple of their games at PAX East, and they were intriguing. Smoke and Mirrors was sort of in the same vein as Love Letter, but an improvement on the concept. I’m also intrigued by Universal Rule, which purports to be a 4x microgame. 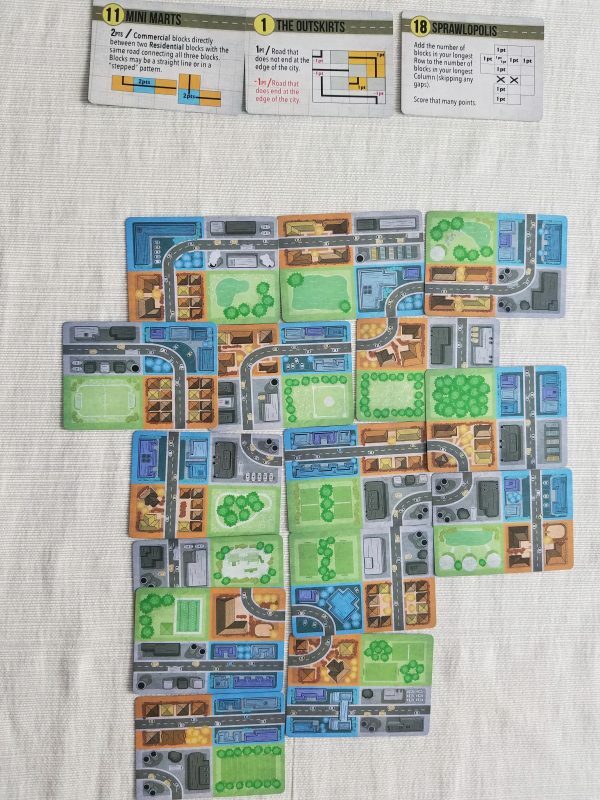 But I got my hands on an early copy of Sprawlopolis, Button Shy’s next release, coming to Kickstarter on the 15th [edit–campaign is on now for the next 10 days], and I’m not going to bury the lede: it is without a doubt the best microgame I’ve ever played. I really shouldn’t be surprised by creative designs with such a tight component restriction–necessity is the mother of invention, as the cliche goes, and I honestly think that design restraints can help focus the mind. With just a few cards to work with you have to get creative and efficient with how you communicate information just to get enough information into your game to make it intriguing. Sprawlopolis does just that with a bit of graphic design both intelligent and completely obvious once you see it. More on that later. First I’ve got to explain what’s going on here. Sprawlopolis is a cooperative card-laying game of trying to build a city landscape according to a varying set of rules. In every game, however, you’re trying to group similar block types (commercial, park, residential, and industrial) and have a low number of total roads. Each card follows a similar pattern: there’s one of each block and roads on all of the blocks except for the parks. On each turn, the active player will simply play one of the three cards they have in hand on the table and pass the other two. When you lay a card down you have to connect some part of its edge to another card on the table–even overlapping. That by itself is a mostly static puzzle with enough charm to last about half a game. The experience is absolutely made by the fact that at the beginning of each game you’re going to randomly select three of the cards and flip them over to reveal additional objectives. The cards provide wonderfully diverse ways to gain (and frequently lose) points that make each game completely different. Every time you sit down to a game of Sprawlopolis you have to ditch your preconceptions and formulate a new strategy based on these cards. And, in a bit of design brilliance I alluded to earlier, each card also contributes to your point threshold for winning the game. It’s an elegant way to allow for so much variation in the kind of puzzles you can encounter while easily shifting the difficulty to match. I can’t overstate how fascinating some of these objectives are. One game you’re going to be trying to create a long, contiguous loop of a road while keeping the parks inside the city. Another game you might be strongly compelled to keep all the business on the outside edge of the city while also putting them adjacent to industrial zones. Maybe you’ll be incentivized to create as big and sprawling a city as possible, or forced to creatively overlap over and over to condense your city into a small footprint. I love it. Each turn is a delightful little morsel of puzzle solving that proves to be compelling without being overwhelming. Sure, there’s some potential for AP-addled players to take too long considering the options, but that’s largely because it’s so fun to try to find the best move. It’s interesting enough when you think about all of the potential plays expanding the city around the edges, but as soon as you start to consider overlapping moves it gets that much better. And, because you pass the cards you didn’t move along to the next player, you can consider what kind of plays you might be opening up for them. As I’ve played this again and again I’ve found myself actually improving in my ability to look at the cards on the table see a good play each turn–a level of skilled improvement you wouldn’t expect from such a small game. It is, of course, a spatial puzzle, so if you don’t like that kind of thing I certainly don’t think that Sprawlopolis is going to convert you. In fact it may be somewhat infuriating because you have to adjust so radically each game. 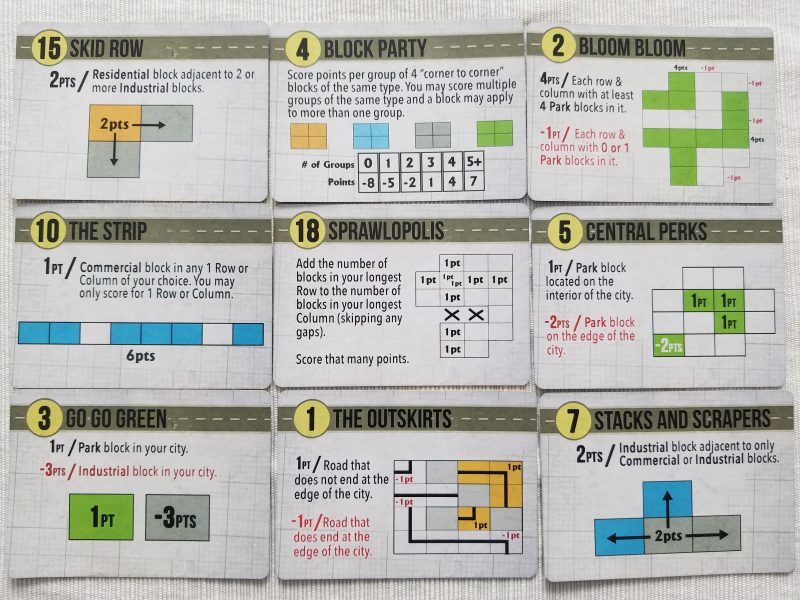 Some of the objective cards are a bit vague in my prototype copy (what exactly constitutes the “edge” of the city?) so I hope they clarify that kind of thing in the final rulebook. Sometimes the combination of objectives you get, together, can make the game harder or easier than it ought to be. There’s not much more to say in terms of negatives. 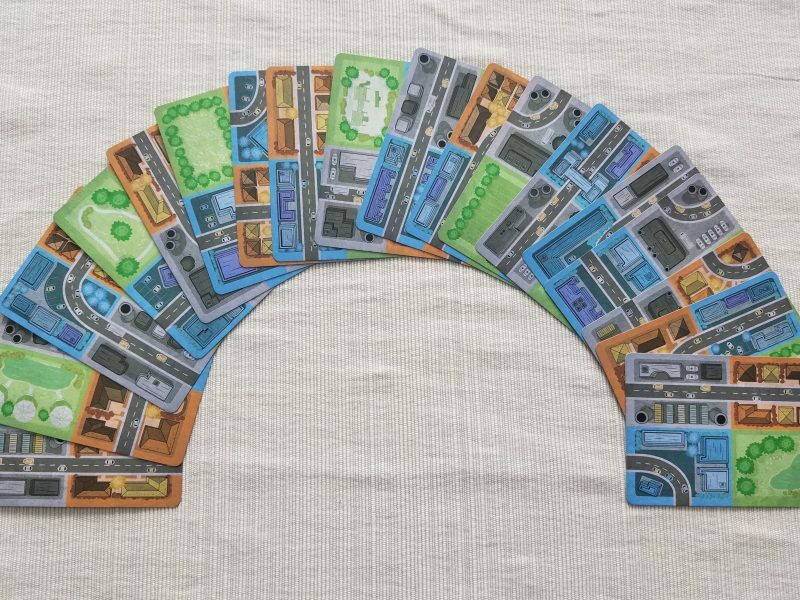 Sprawlopolis isn’t going to make you rethink everything you thought you knew about card games. In some ways it’s relatively modest in its aims. It’s not able to compete with the mechanical complexity that makes some of the greatest co-op games of all time so compelling. But time and time again we keep pulling it out at the end of game nights to play a couple of rounds and see what new challenges await us. It’s simply a good game excellently constructed. Plus it’s like ten bucks and can fit in your back pocket. Buy it.